President Donald Trump just topped the naughty list. Of all the old guys in all of the world you’d expect to ruin Christmas… Much like Scrooge, Jack the Pumpkin King, and The Grinch before him, President Donald Trump just stole the spirit of Christmas. How, you ask, could the leader of the free world get the seasonal festivities so wrong – especially when the government in America has partially shut down for the holidays? Well, one of President Trump‘s duties over Christmas is to answer some phone calls from little kids wanting an update on Santa from North American Aerospace Defense Command (NORAD), which has been tracking Santa since the ’50s. The presidential tradition is part PR stunt and part in honour of the folks over at NORAD, presumably freeing up a little time for the employees who might have their own kids to send good tidings to at this time of year. It’s really sweet, in other words. 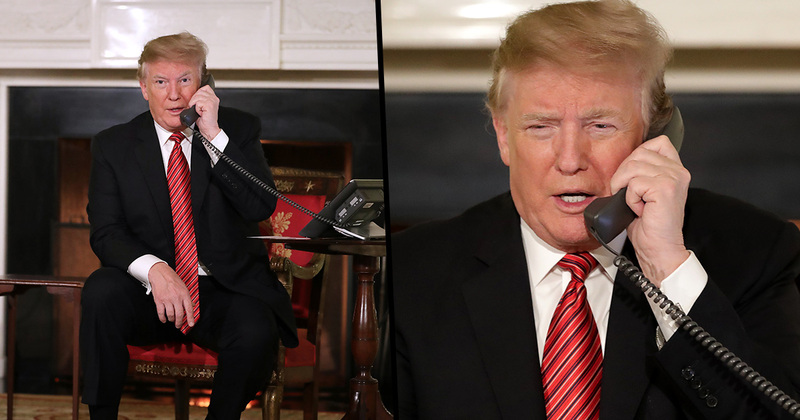 So on Monday night, President Trump and the First Lady Melania Trump answered calls to NORAD from children, calling to learn where Santa Claus is currently located as he flies around the world to deliver presents. But as the President and First Lady chatted with the kids about Christmas, Trump managed to tarnish this oh-so innocent moment by telling a seven-year-old he might be a little too old to believe in Santa. Hello, is this Coleman? Merry Christmas. How are you? How old are you?…. Are you doing well in school? Are you still a believer in Santa? ‘Cause at seven it’s marginal, right? Now, depending on how sharp the little kid is, Trump just came very close to revealing the best kept kids’ secret in history, and debunking the Santa Claus legend on Christmas Eve. Some say it might be the prudent thing to do to tell a seven-year-old the ‘truth’ about Santa. But UNILAD spoke to an expert in the field of psychotherapy who claims kids who believe in Santa Claus for longer actually make happier adults in the long-term. If you believed in Santa for longer it is likely you will be happier in adulthood for it. He added parents can have a hand in helping their kids along the road to happiness by ‘ensuring’ their ‘belief in Santa stays sacred for as long as possible’. By maintaining this innocent magical belief in Father Christmas and its traditions you are indeed developing not just psychologically but neurologically too. This is because part of the adult brain is activated when you think about Christmas or see anything that is associated to the festivities and it makes you feel extra happiness with joy-inducing nostalgia. Research indicates 85 per cent of four-year-olds say they believe in Santa, 65 per cent of those aged six still believe, but only a quarter of eight-year-olds said they believe in the existence of the round-bellied symbol of Christmas, according to a study published in The American Journal of Orthopsychiatry. Scrooges might say the eight-year-olds should grow up. But, if you suspend reality to believe in Santa long enough and let the magic of Christmas warm the cockles of your heart, you’ll probably be happier in adulthood, according to science, and better adjusted to cope with the societal divides promoted by Mr. Trumps’ horrible political rhetoric. So, has President Donald Trump just ruined this kid’s chances at a happy adulthood? How’s that for a lump of coal under the tree.